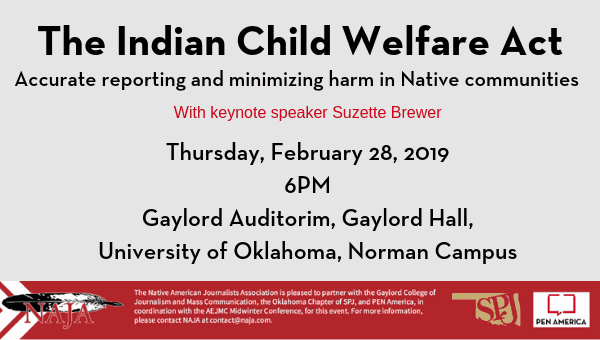 In partnership with the University of Oklahoma, the Native American Journalists Association (NAJA), and the Society of Professional Journalists OU Chapter, PEN America is pleased to present an Indian Child Welfare Act reporting symposium, featuring keynote speaker Suzette Brewer. The event will be held February 28, 2019, at the University of Oklahoma. Advanced registration is required, and can be completed here. Brewer (Cherokee), an award-winning writer who has extensively covered the Indian Child Welfare Act (ICWA), environmental issues on Indian reservations, the opioid crisis, and violence against Native women and children, will advise students and attendees about best practices when reporting on ICWA and other issues of sensitivity in Native American communities. Her keynote address will be followed by a panel discussion of students, local journalists, and other experts who will examine and discuss the issues and their importance to both Native and non-Native audiences. Admission to the symposium is free to all NAJA, SPJ, and PEN America members, and refreshments will be provided to all attendees. Suzette Brewer is a citizen of the Cherokee Nation and an award-winning writer specializing in several areas of federal Indian law, including the Indian Child Welfare Act, environmental issues on Indian reservations, the opioid crisis, and violence against Native women and children. She has written for The Dallas Morning News, The Denver Post, the Denver Business Journal, among others. Her published books include Real Indians: Portraits of Contemporary Native Americans and America’s Tribal Colleges and Sovereign: An Oral History of Indian Gaming in America. She is the 2015 recipient of the NAJA Richard LaCourse-Gannett Foundation Al Neuharth Investigative Journalism Award for her work on the Indian Child Welfare Act. She is also a 2018 John Jay/Tow Juvenile Justice Reporting Fellow.